I am fascinated by the beauty of birch trees, particularly in winter. Their shape and form against the whites and blues of a winter sky and the curve of their blue and purple shadows on the snow are something I can look at for hours. I have been painting them in watercolors for over a year now. 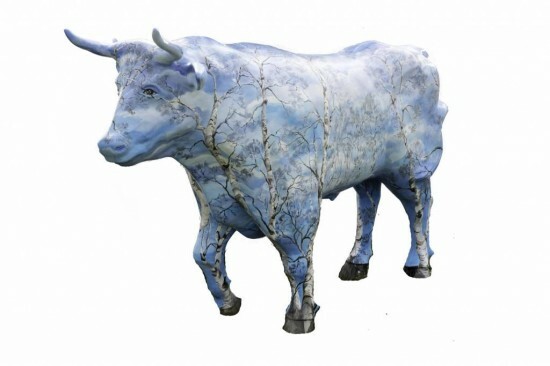 The way they change the landscape with a minimal amount of color is what I thought I would use to change the image of the ox and make him blend into the environment. The trees are strong and yet flexible, as are the oxen. In my mind's eye he is an ox shaped window to the sky, not unlike Magritte’s Surrealist images of sky and superimposed images. He is called “Rooted” because the tree roots anchor his hooves to the ground and contribute to the illusion that he can blend into his environment. I used acrylics to paint the sky over the entire ox and then added the birches on top. I focused on the turn of the limbs of the trees to camouflage the limbs of the ox, and the black curved lines and striped pattern on the trees camouflage the eyes and musculature of the animal.